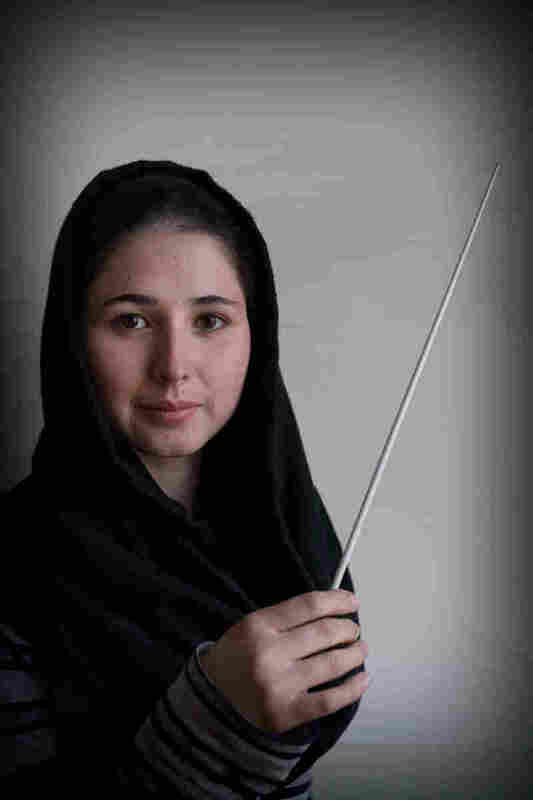 All-Female Orchestra From Afghanistan Is A Force For Change : Goats and Soda An orchestra composed of 30 Afghan women, ages 14 to 20, is defying stereotypes and reviving the country's musical tradition. Marjan practices at the Afghanistan National Institute of Music in Kabul. 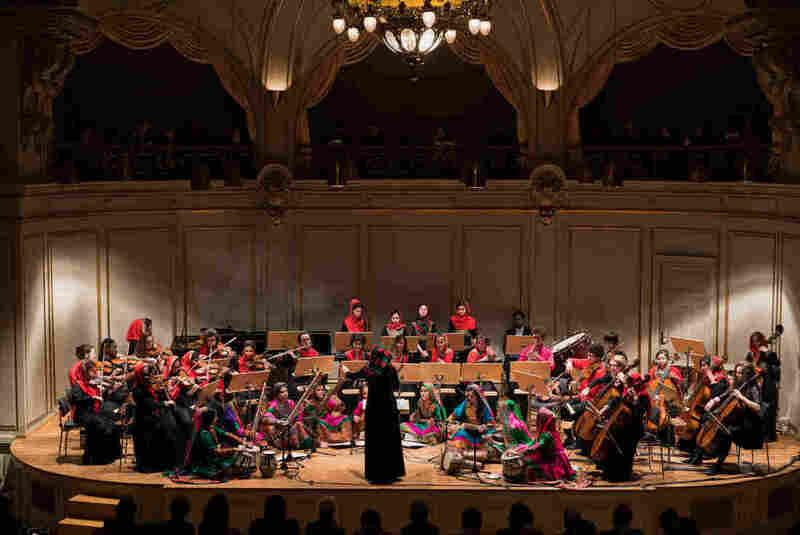 It's perhaps the unlikeliest symphony orchestra in the world — an all-female ensemble from a strict Muslim society where it's often dangerous for young women to step outside of their homes unescorted. It's called Zohra — the name of a music goddess in Persian literature, according to its founder. And they were performing at an unlikely venue — a hall attached to Kaiser Wilhelm Memorial Church, a bombed-out ruin in western Berlin commemorating the horrors of World War II. It's just steps from where Berliners experienced their first ISIS-linked terror attack six weeks ago. But to Ahmad Naser Sarmast, 54, of Kabul, the Afghan musicologist who founded the orchestra, the venue for their second-to-last European concert made sense. Sarmast is on a mission to restore his country's rich music tradition decimated by decades of war. He told Sunday's largely German audience that the location resonated with him and his 30 female musicians, who range in age from 14 to 20. Sarmast — himself a survivor of a suicide bombing in Kabul in 2014 — dedicated the concert to the 12 people who were killed in the German attack. He added that the orchestra members would try and "wash away with the beauty of music the blood spilled on the streets of Berlin." The orchestra's European tour started at the World Economic Forum in Davos in mid-January and ends Tuesday night in the eastern German hamlet of Weimar. An all-female orchestra was an idea that came from female students he taught. Sarmast said a couple of years ago he initially thought of maybe a four-or-five member ensemble, but that there was so much interest that it quickly evolved into the 30-woman orchestra. 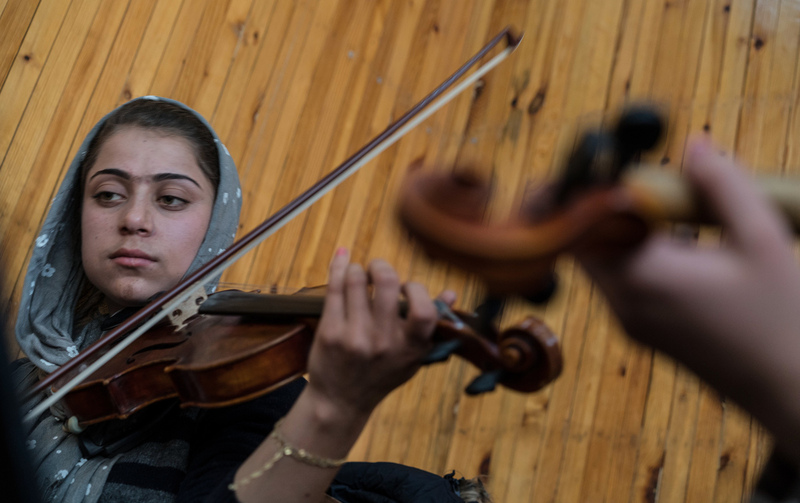 Sarmast bragged that many of its members, who are students at his Afghanistan National Institute of Music (ANIM) in Kabul, are not only the first in their families, but sometimes the first in their province to play musical instruments. According to the ANIM Web site, Afghan children wanting to come to his school audition after they finish third grade and are tested on their musical aptitude. Half the spaces are dedicated to female students and homeless or orphaned children. The "Zohra" members performing in Berlin dressed in traditional embroidered costumes and brightly colored headscarves — many of them in the green, red and black of the Afghan flag — played traditional South Asian instruments like the sitar and its ancestor, the Afghan rubab and the bongo-like tabla, as well as European inventions like the piano, violin and oboe. 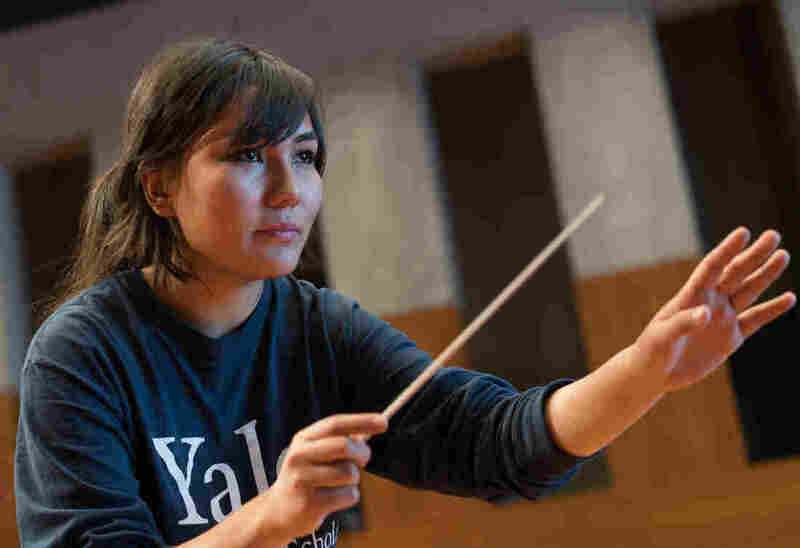 Negin Khpolwak, one of Zohra's two female conductors, said she gets a tad nervous every time she steps into the spotlight but that the music quickly soothes her. "I see the smile on the girls' faces when they play and I don't think about anything else," Khpolwak explained in Dari. "You want the concert to go off perfectly. My whole attention is on that." The petite woman is 19 and belongs to Afghanistan's long-dominant and arch-conservative Pashtun ethnic group. She hails from the restive eastern province of Kunar and sacrificed a lot to get to where she is. 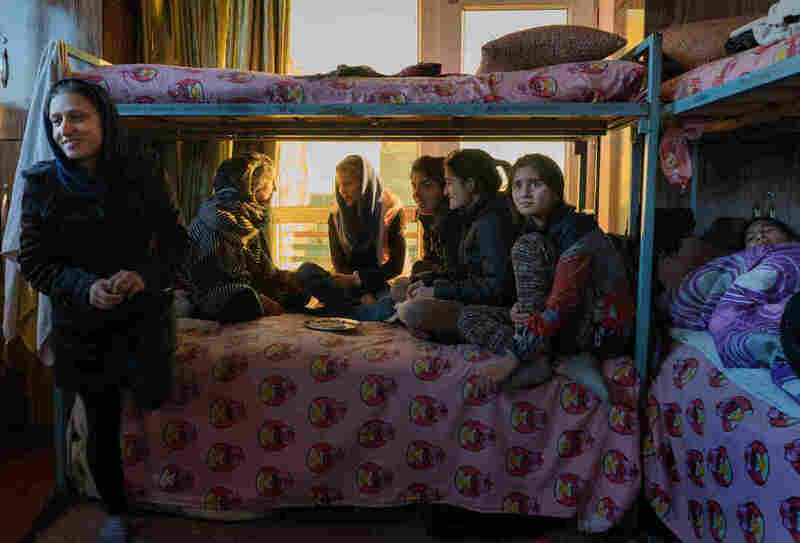 Khpolwak said because her village had no schools and her family couldn't afford to pay for her education, her father took her to live in a Kabul orphanage, where Sarmast's school has recruited some of its students. "But it wasn't until this trip that I learned how valuable we are to Afghanistan and to our people," she added. "We can raise their voice through our music." Their soothing mix of Afghan folk songs and Western classics like Beethoven's Ninth Symphony reflect Sarmast's vision of reestablishing not only Afghanistan's musical tradition but infusing classic and newer Western influences. "I want to make music part of every (Afghan) school curriculum but that takes time," he said. So does creating an Afghan faculty at his school, so for now he still relies on Western educators and foreign donations to help train his staff and students. The U.S. Embassy in Kabul is one of his program's key donors. As to why Sarmast risks the ire of Afghan society by training and featuring female musicians in concert, he told me it's not a choice. "Afghanistan should move on the same path as every other nation goes," he declared. "And the girls and the women of Afghanistan should also enjoy the freedom that ... other girls and women are enjoying outside of Afghanistan. "We can't build a democratic society in Afghanistan if we will be neglecting half of the population of this nation," he added. And he thinks they're doing a better job than their male counterparts. "To me it seems right now that the Zohra orchestra probably will become the [first] national orchestra of Afghanistan, because they are much more disciplined" than his male students, he said. Given the unusual nature of the orchestra, security is a concern. Since Sarmast's own near-death experience in the Kabul suicide attack, he is hypervigilant about looking for any potential threat to his young charges, including on social media and on Afghan broadcasts. "We are working in an environment where we have millions of supporters, but we also have some very vocal ...enemies who are very much pro-Taliban minded," he explained. Khpolwak said threats won't keep her from playing. Nor will it deter her fellow female conductor, Zarifa Adiba. The 18-year-old, declines to reveal her ethnicity, explaining: "I'm Afghan and before being Afghan, I'm Muslim and before being Muslim, I'm human." She was born in Taliban-rife Ghazni province, one of many regions where girls are more likely to marry young than attend school. But she had other ambitions. "The thing that I loved was music from my childhood and my mother is a great supporter of me and she told me, what you love, go ahead and find out. I had kind of view about pop singing rock singing and I wanted to be a pop singer actually," Adiba explained. She was a latecomer to ANIM, starting in the ninth grade. There she discovered music was more than singing and that girls could play musical instruments, too. She started with the flute: "It was so beautiful," she explained, but soon began exploring other instruments. "All of them were cool ... but the viola was ... was so attractive me," she said. "There was just one boy and one girl playing the viola and I said I wanted to be the second girl playing viola." Adiba said she's loved playing in Europe this month but is eager to go home, especially after learning that an uncle, who had always disapproved of her playing, recently told her mother how proud he is of his niece. "I'm happy that at least I changed my family," she said, adding, her fellow musicians, too, "are going to change their families and when their families are going to change, you can have a society which is changed."